One of the most influential American novelist, dramatist and short story writers Don DeLillo is widely acclaimed for portraying characters who smear comprehensive visual rendering of American life in the late 20th and early 21st centuries. He is way forward in producing wonderful works with his special power of blending the intellectualism with human characters and a dark sense of humor in such distinctive ways that quite a few authors possess. He is the author of plays The Engineer of Moonlight (1979), The Day Room (1986) and Valparaiso (1999), Love Lies Bleeding (2006) and The Word For Snow (2007) and sixteen novels Americana (1971), End Zone (1972), Great Jones Street (1973), Ratner’s Star (1976), Running Dog (1978) including some popular and award winning novels Falling Man, Libra, White Noise, and Underworld, which was called to be one of the three preeminent and greatest novels of the preceding twenty-five years by The New York Times Book Review. He has also written several short stories including The River Jordan (1960), Take the “A” Train (1962), In the Men’s Room of the Sixteenth Century (1971), The Angel Esmeralda (1995) and Hammer and Sickle (2010) among many others. DeLillo remarkable works earned him the PEN/Faulkner Award for Fiction Mao II in 1991, the National Book Award in 1985 for White Noise, and the Jerusalem Prize, an American Book Award in 1998 for Underworld and the William Dean Howells Medal of the American Academy of Arts and Letters in 2000 for the incredible contribution in the world of fiction in the past five years and received several nominations including National Book Critics Circle Award for White Noise, Pulitzer Prize for Fiction for Underworld, James Tait Black Memorial Prize for The Body Artist, The Story Prize for The Angel Esmeralda, and Man Booker International Prize and many others. 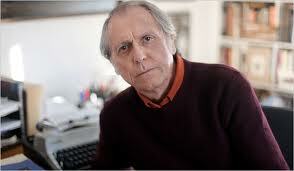 Don DeLillo was born on November 20, 1936 and brought up in a working-class Italian Catholic immigrant in an Italian-American neighborhood of the Bronx in New York City. Remembering his memories of spent years in The Bronx, he details how as a little boy he would always be out in the street thinking himself to be a baseball announcer on the radio and years of living of eleven members in a small apartment which was not a problem for him. Becoming a writer was never his dream and love for reading was something he developed on his late 20s in his summer job as parking attendant where he spent several hours watching over vehicles, things around and reading books of William Faulkner, James Joyce, Flannery O’Connor, and Ernest Hemingway. In 1958, on earning a bachelor’s degree in communication art from Fordham University in Bronx, when he couldn’t secure a job in publishing business he joined advertising. In 1971, he managed to publish his first novel ‘Americana’, which took him four years to complete. Through 70s he wrote six novels and received Guggenheim Fellowships for his extremely creativity in the arts. By the year 1984, he had already seven novels in the market but without wide recognition except in small academic circles. In 1985 he finally received warm welcome and respect as a novelist with his eighth novel ‘White Noise’, which immediately became a success.